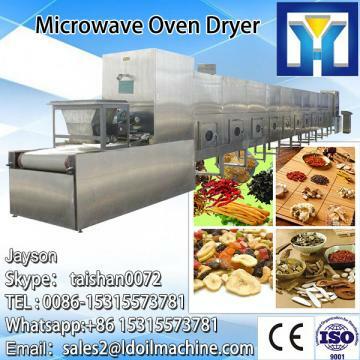 Buy Energy saving microwave drying machine for ceramic - Shandong Microwave Machinery Co.,Ltd. Energy saving microwave drying machine for ceramic from Shandong Microwave Machinery Co.,Ltd. Energy saving microwave drying machine for ceramic is different from the traditional drying machine, Microwave Sterilization Equipment is the overall heating, because the external heat is easy to distribute, so Energy saving microwave drying machine for ceramic heat conduction direction and moisture diffusion direction are same. Compared with the traditional drying method, Energy saving microwave drying machine for ceramic has the advantages of large drying rate, energy saving, high production efficiency, uniform drying, clean production, easy to realize automatic control and improve product quality, so Energy saving microwave drying machine for ceramic is more and more important in various fields of drying. 1.Packaging: Inside plastic bag, outside wooden case for Energy saving microwave drying machine for ceramic (Based on the customers' need adopt the wooden case or wooden pellets, etc.). 6. 1 year complete warranty for Energy saving microwave drying machine for ceramic. Shandong Microwave Machinery Co.,Ltd.is a microwave sterilization equipment factory specializing in the production of Energy saving microwave drying machine for ceramic, scientific research,manufacturing,installation, commissioning.Shandong Microwave Machinery Co.,Ltd.can provide Microwave Sterilization Equipmentcustomers with design and services of 1-2000 tons Energy saving microwave drying machine for ceramic. Shandong Microwave Machinery Co.,Ltd. have finished hundreds of successful projects Microwave Sterilization Equipmentover the years: peanut oil, soybean oil, rapeseed oil, cottonseed oil, sunflower oil, sesame oil, animal oil,grape seed oil, acer truncatum oil, peony seed oil, walnut oil, hemp seed oil, pine oil, tea seed oil, papaya oil, milk thistle seed, and other special type Microwave Sterilization Equipmentoil. Shandong Microwave Machinery Co.,Ltd. have independent import and export department. Shandong Microwave Machinery Co.,Ltd. Microwave Sterilization Equipmentequipment has been successfully exported to more than ten countries: Russia, Australia, India, Afghanistan, Cameroon,and so on.